It’s all upside down (Apple Cake)! Very quick brain dump of notes from my latest and greatest baking experiment. 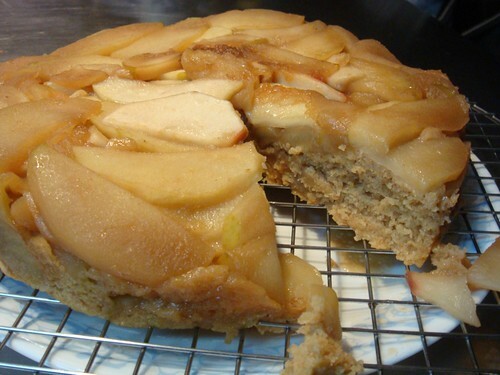 I made an Upside Down Apple Cake from a recipe out of Cook’s Illustrated, October 2009 issue. For those of you unfamiliar with Cook’s Illustrated, it is a magazine that the folks at America’s Test Kitchen put out. It’s filled with recipes and other wonderful little articles about cooking and baking related topics. My personal favorite is how they narrate the whole process in which they try to improve on recipes and how they find out what works and what does not. So, from this particular “article” by Yvonne Ruperti, she undertakes the task of transforming the Upside Down Pineapple cake into an Upside Down Apple Cake. She goes through the problems she encounters and what she does to address each issue. The resulting recipe is listed after the article. I’m in a bit of a hurry, so I’m not going to type out the recipe (if you can find archived copies at your library, you have an awesome library), but I will list my substitutions. I accidentally mixed up my sugar ratio. Instead of 0.75 cups granulated sugar and 0.25 light brown sugar, I used 0.75 loosely packed brown sugar (Organic Trader Joe’s brown sugar), and 0.25ish granulated sugar. Instead of just melting 6 tablespoons unsalted butter, I browned 6 tablespoons unsalted butter. I swapped out the 0.5 cups sour cream with 0.5 cups greek yogurt (Fage, full fat variety). I also brushed a little of the browned butter on my cake pan to grease it up. In the process of putting this cake together, I made the mistake of cooking some of my apples through. No biggie, some of them were just a bit mushier. When I transferred the cooked apples to the pan, I carefully transferred it without pouring all the liquid into the pan. A little was fine, but I didn’t want all that cooked out liquid back in my cake. Otherwise, I kept everything the same. It was super easy to assemble, and no big mixer required. The cake popped out of the pan beautifully, and I only lost 1 slice of apple to the pan (which I promptly ate). My mistake with the sugar worked out really well. It gave it a nice fall warmth to it. 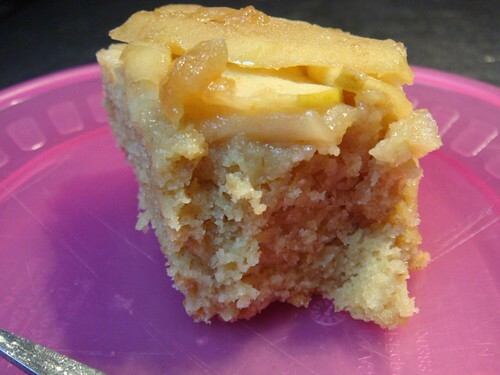 The cake was dense enough to hold up to the apple topping, but was still cake like. 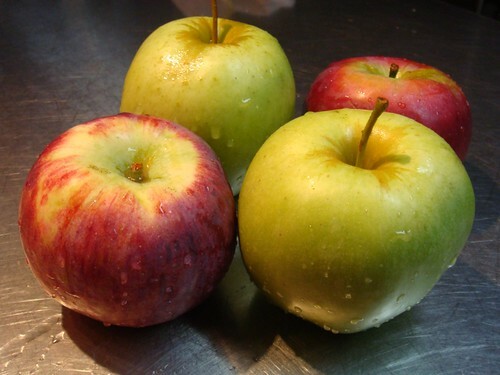 This entry was posted in Uncategorized and tagged Apple, Cake, Dessert. Bookmark the permalink.